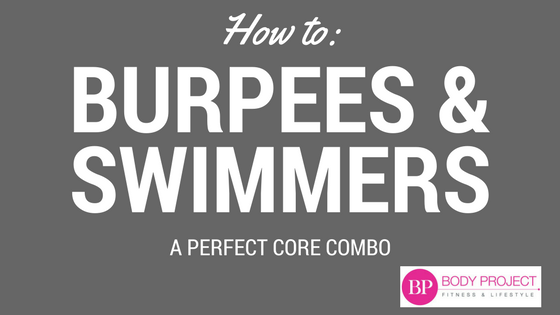 Burpees and Swimmers are a great combo because they work complementary muscles. Here are two short videos with tips, progressions and options for these two fantastic core strengtheners and cardio conditioners! We do burpees…not for torture…but to help increase hip mobility and core work (primary) and also to elevate the heart rate (secondary). Here are tips, progressions and options for executing a safe and effective burpee! Swimmers are an ideal exercise to strengthen the whole back chain of muscles where many of us tend to be weak, inflexible and generally lack mobility. Start with minimal movements, especially if these are a challenge for you, then gradually increase the movement as you progress.